Of all the ways to use all the wonderful butternut squash that is in season right now, this Thai Butternut Squash Soup recipe* is by far my favorite. I love anything Thai-inspired, using ginger, garlic, lime, and cilantro. All those flavors together are fabulous, but combine them with butternut squash and it gives this a rich creaminess that is quite addictive. The only big variable here is the butternut squash preparation. There are two ways that you can do it. OPTION #1: Roast, puree, and make ahead. This is the way I like best because it creates a creamier soup. I prefer to just slice it down the middle, remove the seeds and string, and roast it. Then once it has cooled thoroughly, I’ll scoop out the flesh and puree with a little chicken stock. I like to take a kitchen prep day, planning for a nice little block of time, and then I’ll usually do a few squashes at once. This is how I make the recipe for butternut squash soup base HERE, and I’ll keep some of this puree in the refrigerator or freezer for a recipe like today’s Thai Butternut Squash Soup. OPTION #2: Cook Now Method. Or, if you don’t have the puree done ahead of time, you can simply chop the squash up into small one-inch cubes and simmer in the chicken broth and coconut milk for about 20 minutes, or until tender. There you have two different methods depending on how much time you have. Now the leftovers…I can’t wait to pour the leftover soup over noodles or rice…nom nom! In a large stock pot heat oil over medium heat, add onions, ginger and garlic (and jalapeno, if you want some heat). Cook, about 5 minutes or until onion is translucent. Stir in remaining ingredients: red curry paste through lime. Cook for 10 minutes until it begins to thicken. If it gets too thick, add more chicken stock. Before serving, stir in shrimp and simmer about 2 minutes. Serve in bowls garnished with cilantro and a lime wedge. You might also like my recipe for Baked Butternut Squash Soup HERE. Perfect!! I have a butternut squash I picked up and shrimp in the freezer. 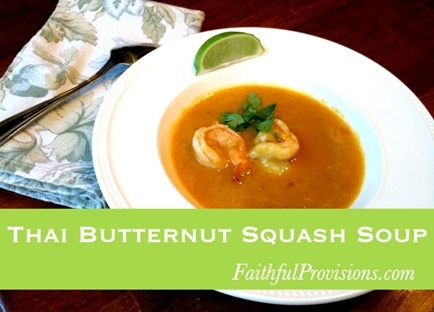 I love butternut squash just cut up and roasted with olive oil, salt and pepper, but this soup sounds delish! I have been craving Thai food, so this just might fill the ticket! Thank you so much!